1. Figure out an answer to “how was your break?” Admitting that you spent your entire break rewatching “Breaking Bad” and sleeping is a lot better than no answer. 2. Make yourself food. Because soon enough you will not have the time or energy to do so. Bonus: Invite some friends over you haven’t seen in a while to join you! 3. Visit the Campanile, or go on a hike. Remind yourself that Berkeley is really beautiful. 4. 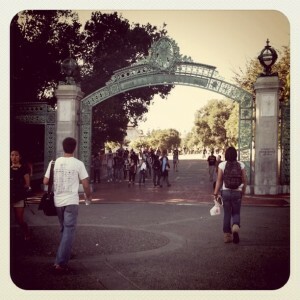 Get a flier from someone on Sproul Plaza. Just do it. 5. Buy your textbooks, but do not open them — on the off-chance that you have to drop the course, you won’t be able to return them if they’re opened. Only allow yourself a few moments to cry over the price. 6. Create a list of all the awesome things you want to accomplish this semester. Make them wild and almost impossible, and know you probably won’t finish all of them. 8. Get your bus pass. 9. Eat out. Yes, also make yourself food, but making the trek to Cheese Board or someplace else away from the typical Telegraph Avenue eateries will be a good treat. 10. Beware of awkward encounters like this.